Evan and I got up at 5 am to get ready to register his classes at 6 am. Everything was all done by 6:30 and we went back to bed. When we finally got up around 10ish we made a nice pancake and hashbrown breakfast, went to the gym (4 more weeks...we're kicking it into overdrive!) 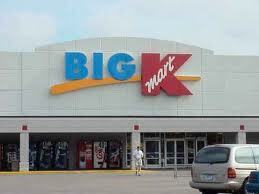 and then we went to Kmart. We both thought, "why have we never shopped here before?" its the convenience of Walmart without the ego. I must say, I was impressed.